Anabel's of Scottsdale - Quality 4-star motel accommodation located in an old-world garden setting, along with a restaurant featuring Tasmanian gourmet fare and fine wine. Tasmania-Imagine - The Tasmanian Government Tourism site, featuring more information on this wonderful state. Tasmanian National Parks - The Web Site of the National Parks and Wildlife Service. The Examiner - Catch up on all the local news before you visit. Local Info - All you could possibly want to know about Tasmania. Ansett Australia - The Official Airline of the Sydney 2000 Olympic Games. 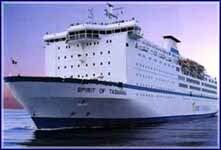 Spirit of Tasmania - If you want to cross Bass Strait by sea, this is the way to do it. Location | Getting there | Sport | Nightlife | Attractions | Accommodation | Home | Email Us!